In this scenario, we have a high-availability pair of Compellent SC8000 controllers, and need to integrate with a Dell M1000e Blade Enclosure. Each SC8000 controller has two dual-port 10 GbE I/O cards. 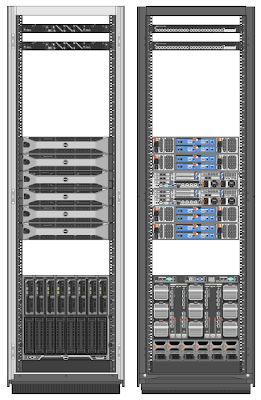 The Blade enclosure has 4 x PowerConnect M8024-k (10 GbE) Blade Switches installed in Fabrics A and C. The blades being used are PowerEdge M620 Half-Height blades, with dual-port 10 GbE Network Daughter Cards (NDC) and dual-port 10 GbE Mezzanine cards in Fabric C. The M620 blades will have VMware ESXi 5.0 installed. Fig. 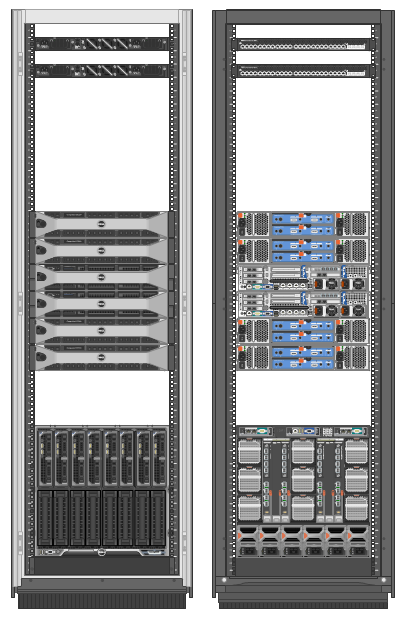 1: Cabinet Diagram (Front and Back) showing SC8000 controllers with SC220 disk shelves and M1000e Blade Chassis with PowerConnect M8024-k blade switches. In the diagram above we have placed the disk shelves either side of the SC8000 controllers, this has advantages regards cabling (especially length of cabling required) and will allow for future expansion in the empty spaces above and below. 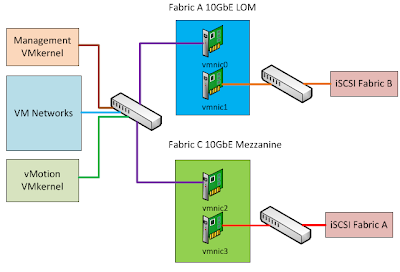 The iSCSI cabling design below provides a dual fabric design (completely independent iSCSI fabrics A and B) with complete resilience to a blade switch failure, or a blade network card failure. Fig. 2: iSCSI Cabling Design with dual fabrics and resilient to blade switch or network card failure. The uplinks to the top-of-rack switches serve for adding in additional external physical hosts if required. Fig. 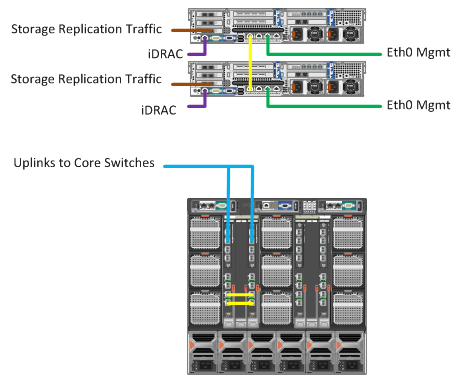 3: VMware Host vSwitch Networking Design with two dual-port 10 GbE network cards. The above vSwitch networking design has a dedicated 10 GbE NIC for iSCSI Fabric A, and another dedicated 10 GbE NIC for iSCSI Fabric B; and these are on separate network cards. 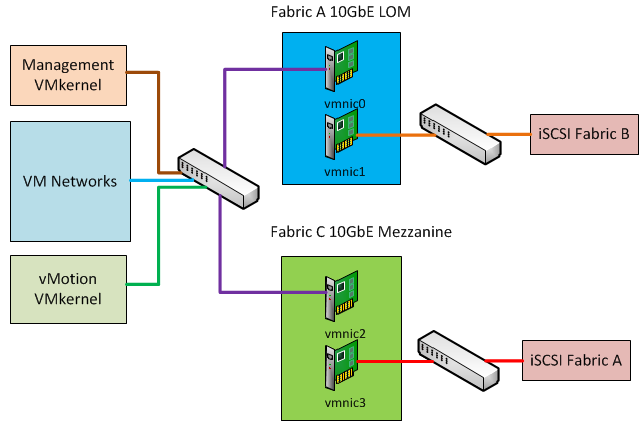 The Management VMkernel, VM Networks, and vMotion VMkernel, all share the same vSwitch which has two physical 10 GbE NICs and is connected to stacked M8024-k Blade Switches. For reference, the below diagram highlights some of the other cabling considerations involved. Fig. 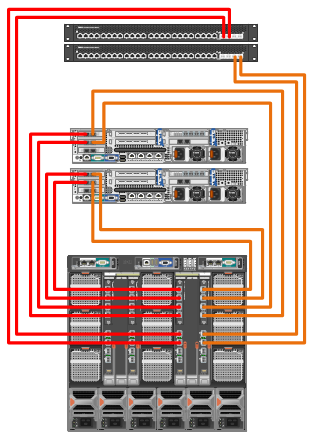 4: Cabling for non-iSCSI networks, and other SC8000 connections.